INDIANAPOLIS — The top-seeded Ohio State women’s basketball team is in familiar territory yet again. Following its second victory of the season against Rutgers, the Buckeyes have a chance to claim a second victory versus fourth-seeded Minnesota. Ohio State (25-6, 13-3 Big Ten) will play Minnesota (23-7, 11-5 Big Ten) at 6 p.m. Saturday in the semifinals of the Big Ten Tournament with a shot to play in the conference championship game on the line. This matchup will be the second time these teams meet this season. When the two teams played on Jan. 4, the Buckeyes beat the Golden Gophers 91-75. Minnesota has a core four of productive players who average at least 13 points per game. One of the core four, freshman guard Destiny Pita, scored 38 points in the team’s earlier matchup against the Buckeyes. Her presence will pose a problem for Ohio State if senior guard Asia Doss, who is the Buckeyes’ best perimeter defender, is not available to play due to a sprained ankle. Doss suffered the injury in her final regular-season game against Penn State. 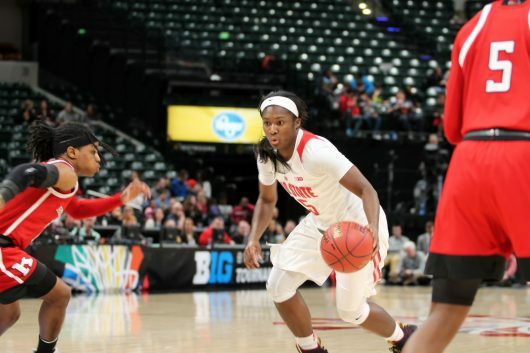 Doss was not cleared to play against Rutgers in the quarterfinals, ending her streak of 134-straight games played. She is considered day-to-day and will need medical clearance in order to return. Doss said her ankle felt 95 percent healthy, but she was being held out for precautionary reasons. In the previous meeting between the two teams, Ohio State senior guard Kelsey Mitchell had 21 points, but went just 7-of-22. Redshirt senior forward Stephanie Mavunga shot 11-for-15 and racked up 25 points in Ohio State’s victory. With Doss out of the lineup, Mitchell has even more of a control of the ball than usual. The Golden Gophers outlasted Iowa forward Megan Gustafson’s 48 points in a 90-89 victory against the Hawkeyes in the quarterfinals. Minnesota’s two leading scorers, redshirt junior guard Kenisha Bell and senior guard Carlie Wagner, combined for 53 points in the game. Minnesota has won six of its past seven games. Two of those wins came against teams that were ranked at the time — then-No. 23 Michigan and then-No. 10 Maryland. If Ohio State beats the Golden Gophers, it will get its shot a chance for the Big Ten Tournament championship. The Buckeyes would play the winner of Saturday night’s game between second-seeded Maryland and third-seeded Nebraska.